The Parish of St. Mary in Norwalk, Connecticut, under the pastor, the Rev. Richard G. Cipolla, has scheduled a full complement of services in the Extraordinary Form of the Roman Rite, as well as traditional devotions that have been a part of the parish’s life for many years. On Good Friday, the traditional procession of the dead Christ through the streets will be completed by the restoration of the tradition (done in many European and Latin American nations) of the washing of the body and preparation for burial. This will take place during Compline and followed by an all-night vigil at the tomb. 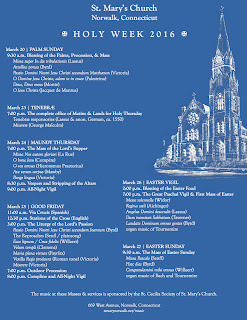 The combined choirs under David Hughes, organist and choir director, will sing at various services, including Holy Thursday, Good Friday, the Easter Vigil.